a source of so much pure and unmixed happiness." Hello, and welcome to Harpsie's website. Harpsie is that handsome guy in the top left corner (and although you probably can't tell, he is in a washbasin). 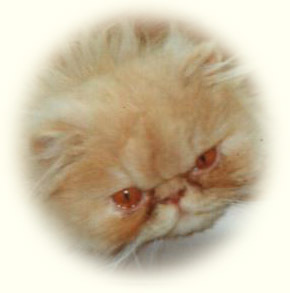 As you can see, he was a Persian cat, a cream shaded cameo to be exact. The first question I am normally asked is why was Harpsie called Harpsie. Well, it's short for Harpsichord. And if you think that's bad, his brother was called Hannibal. There's more about how they got their names on the How I Met My Family and Got My Name page. The second question I'm normally asked is why does Harpsie have his own website. That's because Harpsie managed to have a vast array of feline ailments, to the extent that his cardiologist (Harpsie met a lot of "ologists" in his time) referred to him as "the walking veterinary encyclopaedia." He was also labelled a "feline medical enigma" by a major animal hospital. So basically, I have collated all Harpsie's medical information here, in the hope that it might help others. My name is Helen, and I am Harpsie's "Mum". Little did we know how taking this delicate little cream kitten would change our lives. Over the years Harpsie made us howl with laughter, and sob our hearts out, but we never for one second regretted being his family. I don't have any real aims with this site, other than to give others with sick cats hope, and to try to capture Harpsie's amazing personality, which played a major role in his ability to overcome his many medical challenges. Harpsie was incredibly placid and laidback (except with vets! ), yet he had the most amazing fighting spirit when the chips were down. Despite his many ailments, Harpsie lived until he was fourteen, using up all his nine lives and then some. I would like to emphasise that most of the time Harpsie enjoyed a great quality of life. I'm not in the business of keeping miserable, terminally-ill cats alive. On 8th May 2006 Harpsie was diagnosed with carcinomatosis, diffuse and widespread cancer in the abdomen, which had already spread to the lungs. Neither of these conditions had been detectable only ten weeks earlier when Harpsie underwent extensive testing, so it was obviously a particularly aggressive form of cancer. In addition, it was both untreatable and terminal, as told to us by our vet and confirmed by a visit to an oncologist. We therefore focused on keeping Harpsie comfortable until the time came when he had to leave us. Whilst he continued to eat and to wash his paws afterwards until his very last day, he was finding it increasingly hard to breathe because of the secondary lung cancer. We therefore made the agonising decision to have Harpsie put to sleep on 23 May 2006, 15 days after his diagnosis. We miss him desperately. Please click on the links in the sidebar on the left to learn more about Harpsie and his many ailments. I have tried very hard to ensure that the information provided in this website is accurate, but I am NOT a vet, just an ordinary person who cared for Harpsie with the help of qualified vets. This website is for educational purposes only, and is not intended to be used to diagnose or treat any cat. Before trying any of the treatments described herein, you MUST consult a qualified veterinarian and obtain professional advice on the correct regimen for your cat and his or her particular requirements; and you should only use any treatments described here with the full knowledge and approval of your vet. No responsibility can be accepted. Copyright © Harpsie's Website 2000-2017. All rights reserved. This site is a labour of love on my part. Please do not steal from me by taking credit for my work.